Knuckles in Sonic 2 is the resulting game when Sonic the Hedgehog 2 is locked onto Sonic & Knuckles with its passthrough port. Sonic is replaced by Knuckles and Tails is not playable whatsoever. 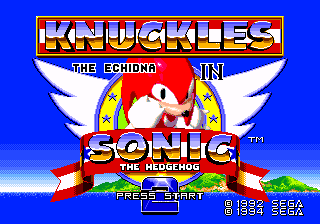 The title screen features Knuckles also but removes the two player mode and options selections from it. This game is identical to Sonic 2 (aside from a few changes to make it more playable with Knuckles) but with Knuckles now playable instead of Sonic or Tails. Sega, though adjusting Knuckles' physics to match those of Sonic & Knuckles in-game, ran into issues with those same physics in the Sonic the Hedgehog 2 pre-game demos. A fix was created to keep Knuckles' jump height consistent with that of the jump height from Sonic & Knuckles but also make the demos function properly. Knuckles' jump was modified so that it reached the same height as Sonic would reach in Sonic the Hedgehog 2, but his mid-air mobility was slowed to give the gimped feeling his jumps had in Sonic & Knuckles. This fix corrected most of these issues; however, the mid-air speed cap caused Emerald Hill and Aquatic Ruin Zone's demos to be left in a sub par state. Six prototypes were found by drx and were released (0524, 0606, 0608, 0610, 0612, and 0618). Knuckles plays the same way he does in Sonic & Knuckles and has the same moves and lower jump height. Using his special moves, Knuckles can explore once inaccessible areas (where secrets such as 1-ups have been added). However, some areas are harder because Knuckles cannot jump very high and accelerates slowly. Some bosses are also harder, such as the boss in Metropolis Zone Act 3, as well as the final boss in Death Egg Zone. The palettes for the title cards were also changed to green and red. Knuckles retains his rings after a Special Stage, making it much easier to obtain Chaos Emeralds. Getting the Emeralds is easier too as the Special Stages have reduced Ring quotas for Knuckles to achieve. Getting all the Chaos Emeralds lets him become Super Knuckles. When using a Pro Action Replay or Game Genie code to access Hidden Palace Zone, it is the same as in Sonic 2, but can sometimes reset the game when getting close to the 'Master Emerald Block' object. Wood Zone is also the same as it is in Sonic 2, but a glitch causes the visible tiles of the level to not update as often when moving around, making it hard to figure out where Knuckles is going. The empty level slots for the Genocide City Zone and Dust Hill Zone are also accessible. When Sonic & Knuckles detects that Sonic 2 is locked on (it checks for Revisions 00, 01 and 02), it transfers control to a special hidden 256 KB ROM chip, often referred to as the UPMEM. This contains the code for the entire game, as well as some data (e.g. Knuckles' mappings and pattern load cues). The only code run from the locked-on Sonic 2 ROM is the sound driver, although much of the game's data is accessed from the Sonic 2 ROM instead of being duplicated in the UPMEM.